​ The photos in the virtual museum are artifacts related to the granite industry. Artifacts have been donated by members and non members who wish to see this history preserved for future generations. 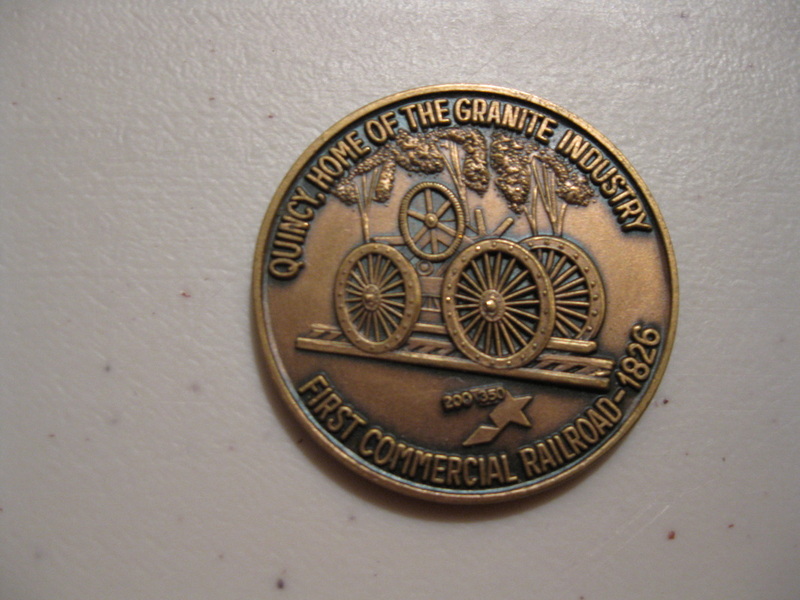 The museum is always looking to acquire any artifacts, memorabilia or information on the granite industry and also individuals who worked in the industry. Check back frequently, we will be adding new artifacts on an ongoing basis. ​Shown here is the grindstone wheel from the blacksmith's shop that supported the quarry operation at the J.S.Swingle quarry in West Quincy. The grindstone wheel was used by the blacksmiths for the finished sharpening after the tools were heat treated in the forge. The Swingle's quarry operation in West Quincy was one of the largest quarry operations in Quincy from the early 20s until the early 50s and was one of the deepest quarries approaching 400 feet in depth when the operations ceased in the early 50s. The grindstone wheel was donated to the museum by Carol Sieverts Ellis and Chris Sieverts, grandchildern of Jonathan S. Swingle in memory of Pauline Swingle Sieverts Schultz daughter of Jonathan S. Swingle. Portrait of Jonathan S. Swingle in oils on canvas painted by well-known artist, J.L. Findlay, in 1927. 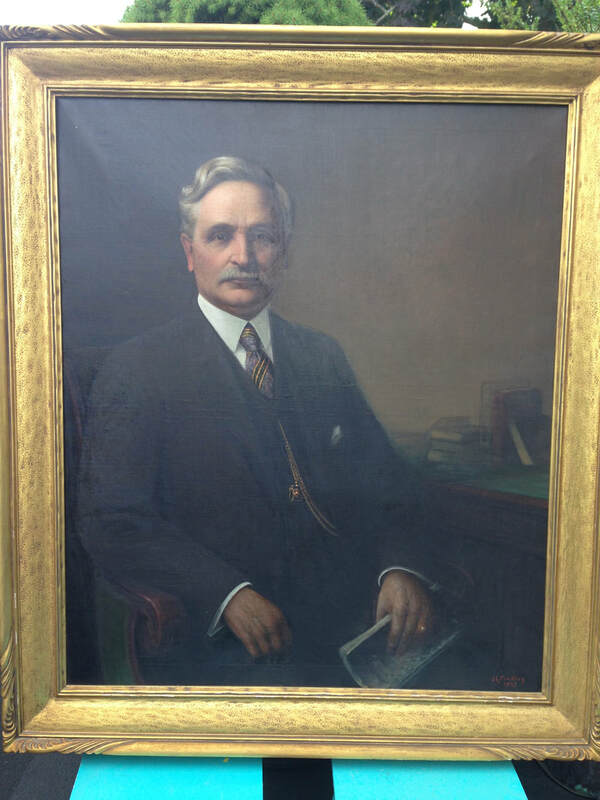 The portrait, including frame, measures 42" x 48" and is in the original frame that hung in his residence in Quincy in the 20's and 30's. Jonathan Swingle was a leader and innovator in the granite industry not only in Quincy but the nation. The portrait was donated to the museum by Carol Sieverts Ellis and Chris Sieverts, grandchildren of Jonathan S. Swingle in memory of Pauline Swingle Sieverts Schultz daughter of Jonathan S. Swingle. 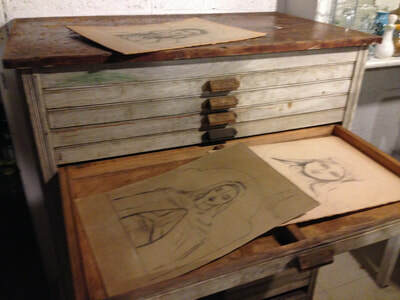 The drawing cabinet of Quincy sculptor John Horrigan who sculptured the Titanic statue. 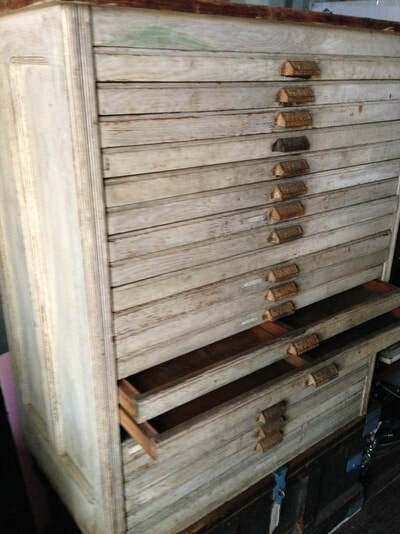 The cabinet was given to Quincy sculptor Levo DiBona, who apprenticed with Gerald Horrigan the son of John Horrigan, when Gerald closed the Horrigan stone shed studio. Before Levo DiBona’s passing he gave the cabinet to his nephew Raimondo DiBona who has donated the cabinet to the Quincy Quarry and Granite Workers Museum. 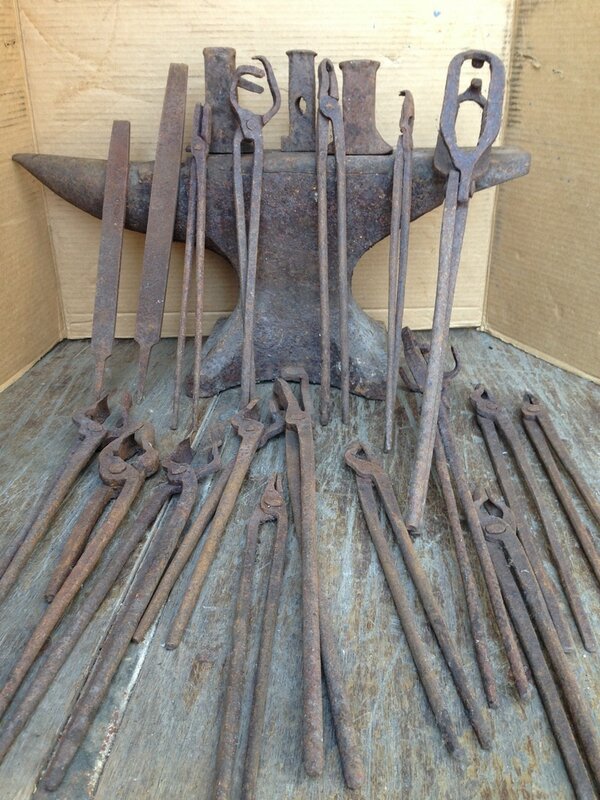 Portable blacksmith forge and a collection of blacksmithing tools including tongs, hammers and his anvil. The donation was given by Daniel Cantelli the grandson of Carmine Cantelli who was a blacksmith tool sharpener from Italy. He worked for Reed and Vendret Company and Peerless Granite Company of South Quincy. During the winter season when the quarries and stone sheds would slow down or even close, he would sharpen tools in his garage basement in West Quincy. The Museum plans to use the forge and tools to demonstrate the sharpening of tools using the methods used in the early granite industry by the blacksmith. 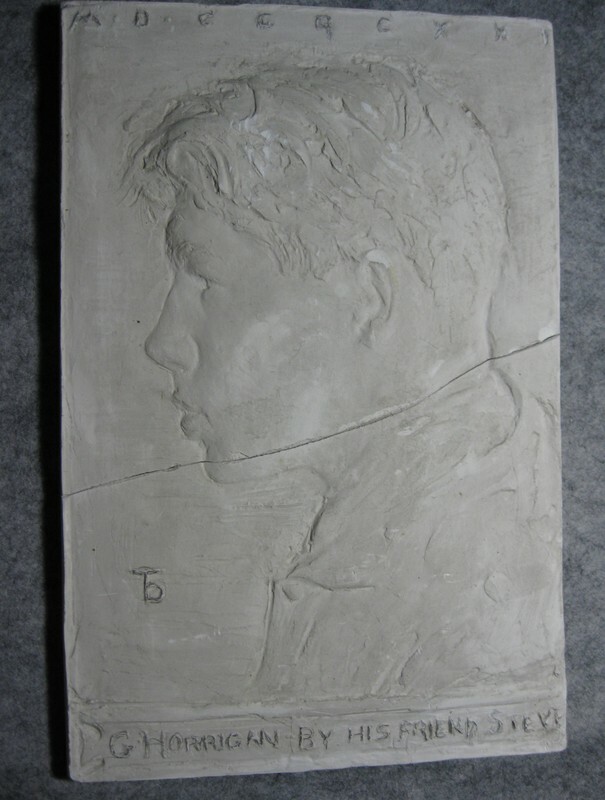 Profile in plaster of Gerald Horrigan who studied on a scholarship at the Museum of Fine Arts in Boston. The profile was sculpted by a fellow student with an inscription at the bottom that reads "G. Horrigan from his friend Steve". Profile in plaster from the collection of the late Levo DiBona who served an apprenticeship with Gerald Horrigan and given by his nephew, Raimondo DiBona. Rare Copy Of " Memoir of Solomon Willard "
The museum received a rare copy of the book " Memoir of Solomon Willard" donated by museum member Doug Bingham . 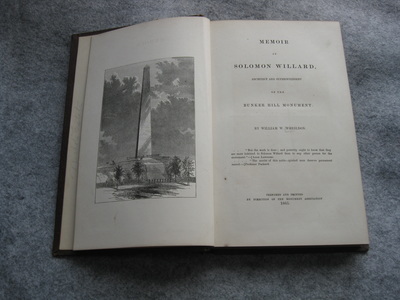 This rare copy documents the story of the building of the Bunker Hill Monument from Willard's choice of Quincy granite, to the transportation of the granite, to the construction of the monument. Photo right Doug Bingham center, presenting copy of Memoir to museum historian Tom Bonomi. 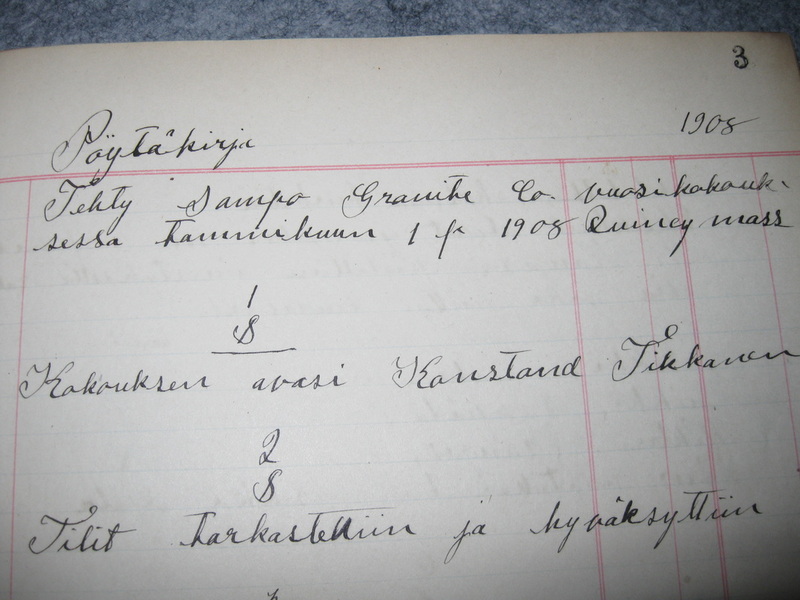 The Sampo Granite Company was formed in 1900 by seven Finnish immigrants, Herman Tuori, Konstant Tikkanen, John Hakola, John Haavisto, Matti Johanson, Mikko Seppala and Matti Raisio. 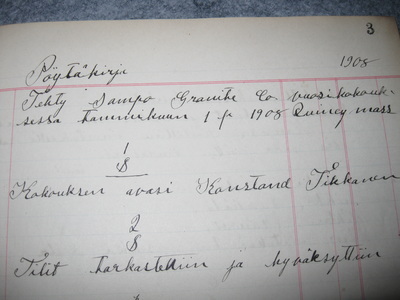 In 1910 they incorporated and issued shares in the Sampo Granite Company. 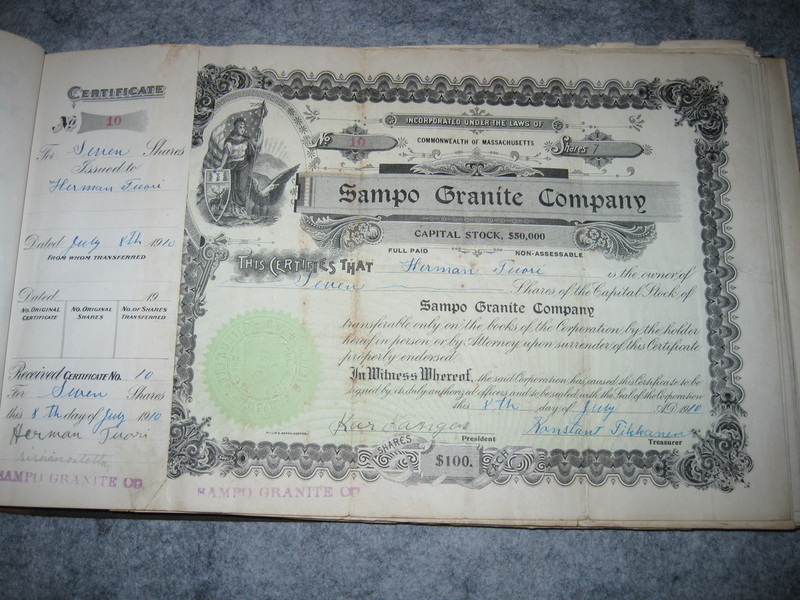 This is the actual share certificate booklet of 1910 of the Sampo Granite Company. 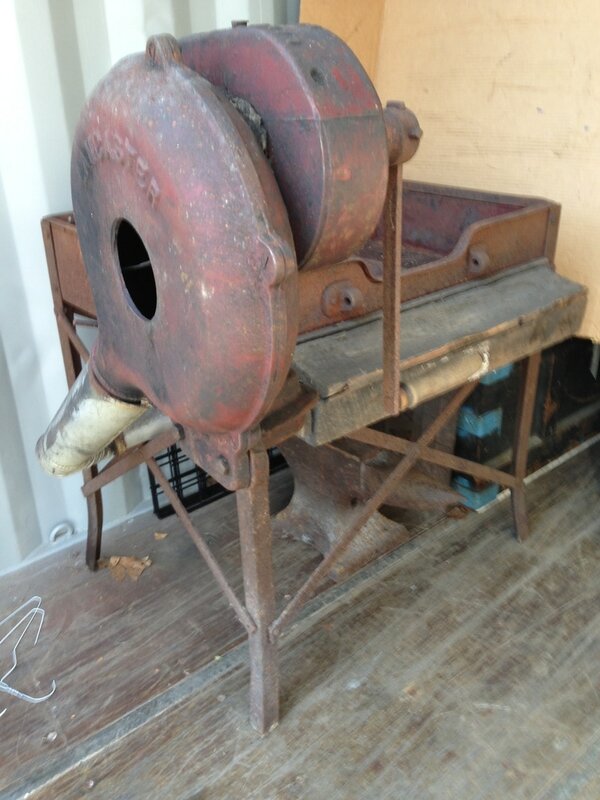 Donated to the museum by Paula and Paul Nisula grandson of Andrew Nisula the last owner of Sampo Granite Company. 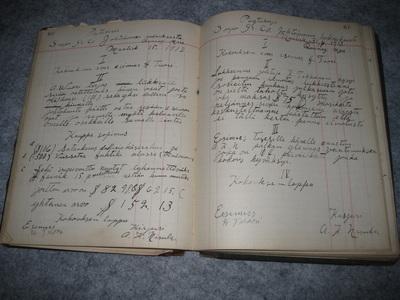 The first written records of a granite company's day to day business activities that the museum has acquired. The ledger includes customers' orders, wages paid, yearly profits and losses and miscellaneous business information of the Sampo Granite Company from 1908 to 1924. 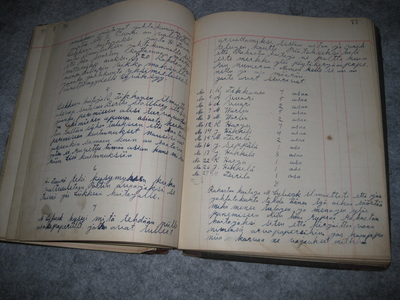 The complete ledger was written in Finnish and donated by Paula and Paul Nisula the grandson of Andrew Nisula the last owner. 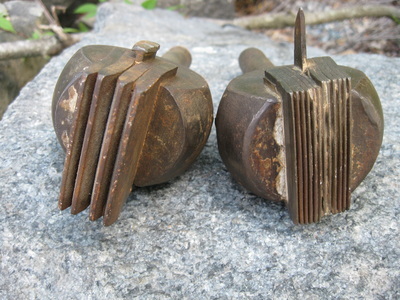 Pneumatic Bush chisels with Bush plates, shims and four point chisels used in the surfacing of granite. The wooden tool box of Thomas Carrigg holding pneumatic tools donated by the Carrigg family. Assortment of polishing discs used in the polishing of granite at the Thomas Carrigg & Son Inc. stone shed in South Quincy. Donated by the Carrigg family. This case of tools made by Philip Pinel in 1868 is a miniature sample of probably every kind of tool in the quarrying and cutting of stone at that time. They were exhibited at that time on the Island of Jersey, England and received first prize and were also exhibited around 1885 at the Masonic Fair in Quincy after Philip immigrating here. The Pinel brothers formed the Pinel Tool Company in South Quincy that manufactured tools for quarrying, stone cutting and contractors tools. The Pinel miniatures were donated by Donna Pinel in memory of the Pinel family. The bush pneumatic surface chisel is used in the final stages of surfacing stone. Pictured here are two bush chisels, one a four plate for roughing and a twelve plate for fine surfacing. 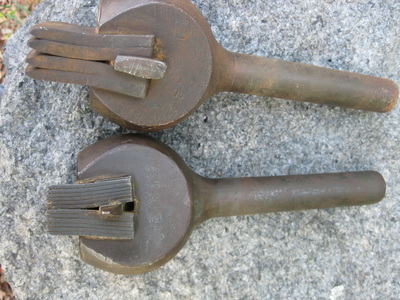 This type of bush chisel was used on the crane type pneumatic surfacer. Typical stone yard tool box of Anselmo "Jimmy" Tempesta owner of Colonial Granite Co., South Quincy from 1928 to 1971. 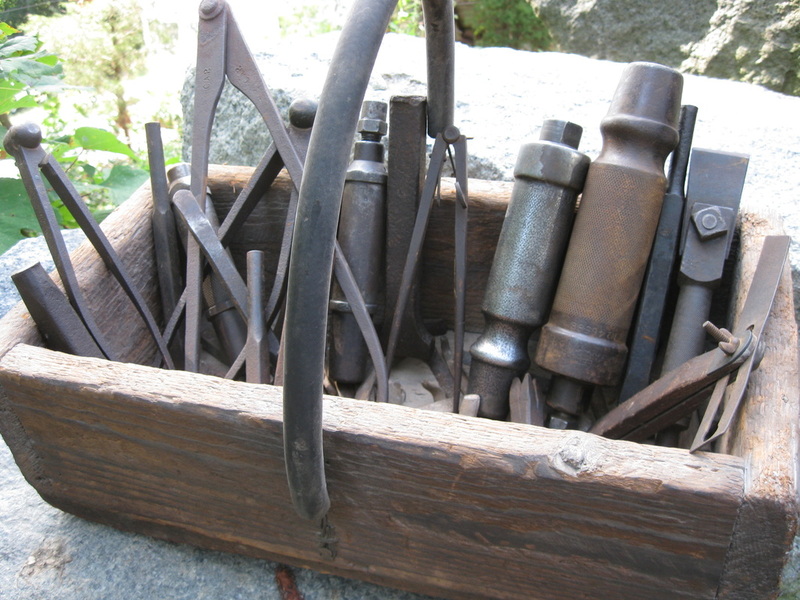 The wooden tool box contained tools he would have used for various stone cutting operations that included cutting, shaping and carving for the many stone products he produced. The tool box contained both hand and pneumatic stone cutting tools. Tools donated by Jim Canniff who bought the business in 1971 under the name of James Canniff Monument Co.
A set of stone cutter's divider's used by stone cutter's, carvers and sculptors to take dimensions and transfer points from models to the finish work on stone. The lettering square is a heavy iron right angle square with a lead filled bottom to prevent scratching and slipping on polished stone. The square was used by the stone cutter for a guide to keep the lettering on the stone straight and square. 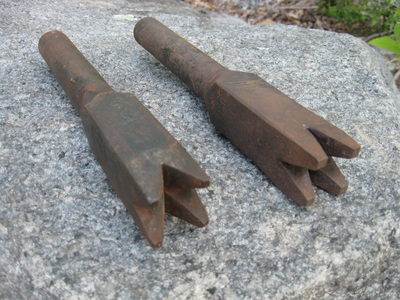 The four-tooth pneumatic surfacing chisel is used for the first stage of rough surfacing . 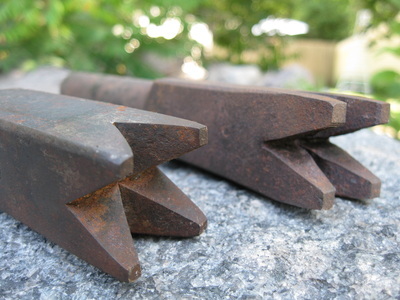 This type of chisel allowed the stone cutter to remove large quantities of stone rapidly. 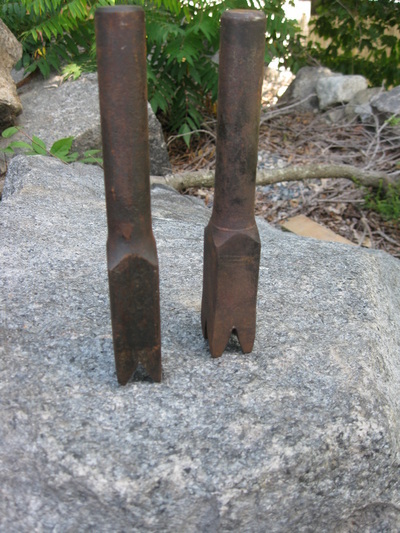 The points were produced in three sizes 1 1/4 ", 1 3/8" and 1 1/2" and were used on the crane-type pneumatic surfacer. Two 22" high turned balusters of light Quincy granite typical of the work of many Quincy manufacturers who were equipped with turning lathes. The two balusters shown here were donated by Bob and Joyce Romeri. Bob's father Bob Romeri, senior, aquired the balusters when the White Granite Company that was adjacent to the Willard School on Miller Street, West Quincy was sold and demolished in the early 1950's. Balusters were used for support for railings of staircases, parapets or used as small pillars. 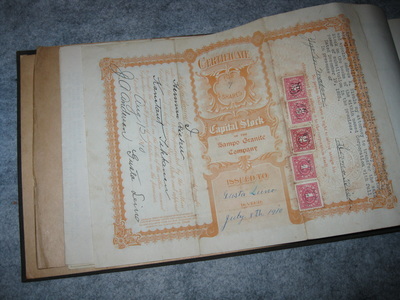 $100 bond issued by the Quincy Granite Quarries Company in 1900, No. 122. 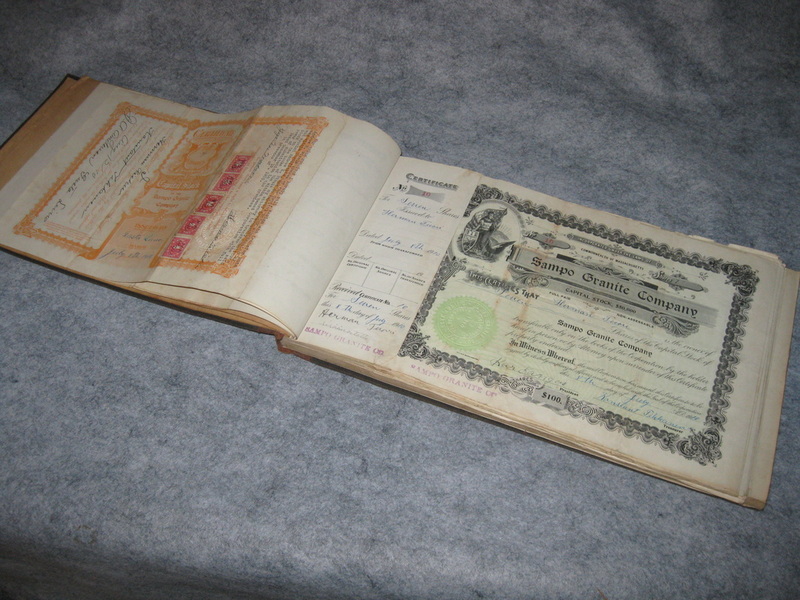 Bonds were issued when Quincy Granite Quarries Company started to buy up many of the quarries in Quincy. They then became known by the granite manufacturers as the "Syndicate". Total assets of the Quincy Granite Quarries Company in 1900 were $3,671,150 and they had acquired 530 acres of quarry land in Quincy. 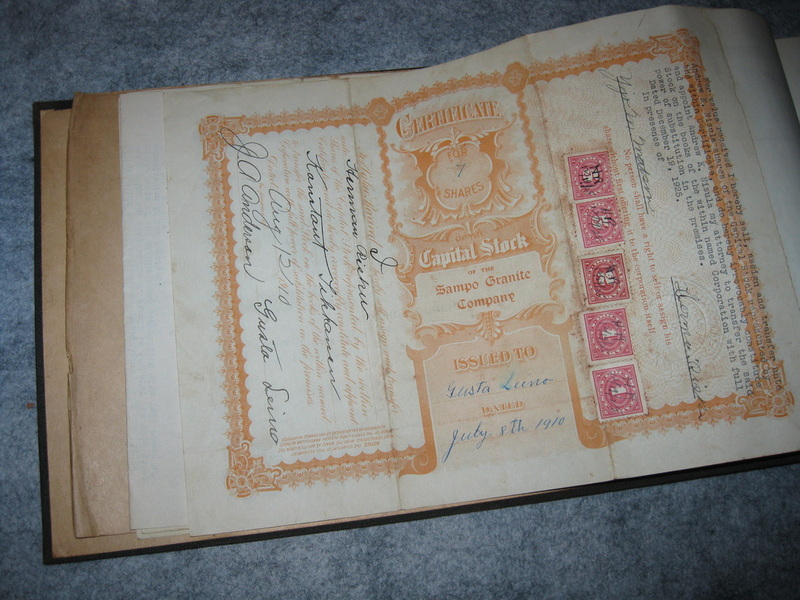 In 1903 the company declared bankruptcy and went into receivership and deemed the bonds worthless. were donated by his nephew Jim Petersen and family member Lori Niemi. Levo Di Bona a Quincy sculptor graduated from The School of The Museum of Fine Arts in Boston, Massachusetts. He served his apprenticeship with Quincy sculptor Gerald Horrigan and became a freelance sculptor in the Quincy area. His collection of drawings, photographs and plaster casts originally donated to Forest Hills Cemetery by his nephew Raymond DiBona and now donated by Forest Hills to the Quincy Quarry and Granite Workers Museum to be the caretakers of this important collection with a Quincy connection. First photo: Plaster cast of St. Francis with child and holding a spray of lillies. Reference points on cast were used to transfer dimensions from cast to the stone work. Second photo: Plaster cast of a branch of roses used as model for monumental stone work. Third photo: Three plaster casts used as model to transfer images using the points embedded in the casts and can be seen rusted in color. The casts also display pencil lines for reference and depth measurements can be seen on the casts. Fourth, fifth and sixth photos: Original penciled working sketches with notations for the sculpting of the plaster casts. 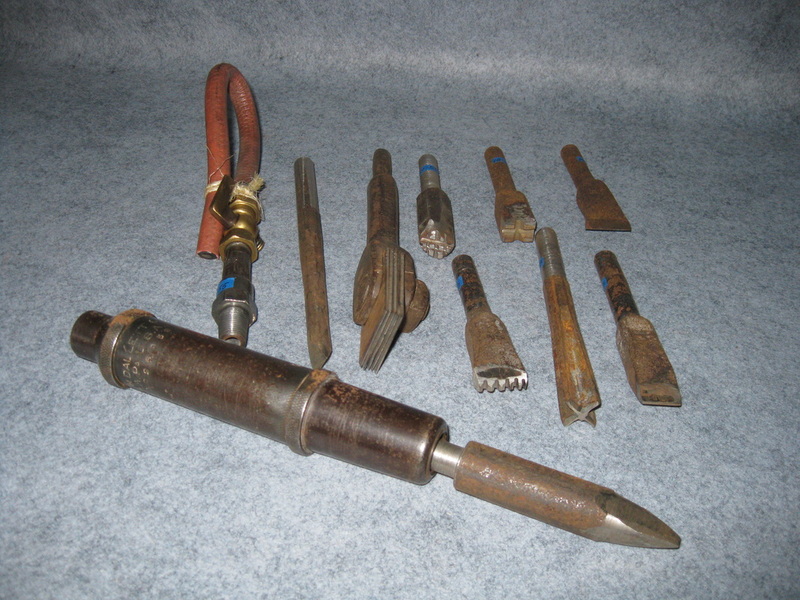 The pneumatic star drill shown here is a 10" long star drill with a drilling diameter of 1 3/4". This type of star drill was used in the quarring operation to split and remove large sections of bed rock in the quarry. In the holes 12" feathers and wedges would have been inserted and hammed to split the bed rock into large blocks. The drll was donated by Charlie Deering and Sally Dawson. The cover of LIFE magazine August 8, 1938 pictured swimmers diving into a Quincy quarry. favorite summer pastime, turn to the story on women's National A.A.U. swimming championships in Santa Barbara (pp.46-47) and Life's Beach Party (pp.61-64). " 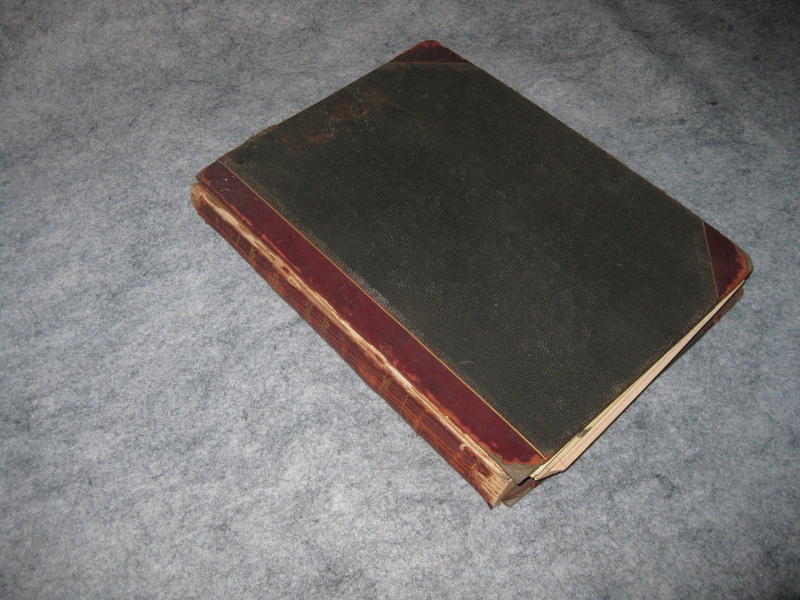 Copies of Life were donated by Sally Dawson and Charlie Deering of Quincy and Matthew Ballou of Lyndeborough NH. great great grandnephew of John Ballou owner of the Ballou quarry in Quincy. Shown here is an assortment of blacksmith tools used in both the quarrying and stone shed operations.Each operation had a blacksmith to manufacture equipment and tooling to support the removal and manufacturing of stone products.The main function of the blacksmith was the sharpening of tools to keep the production cost competitive.There were many different types of tongs and hammers used in blacksmithing.The tools shown here belonged to Joseph A. Cantelli and donated by his son Joe Cantelli. Polished balls of Quincy granite. 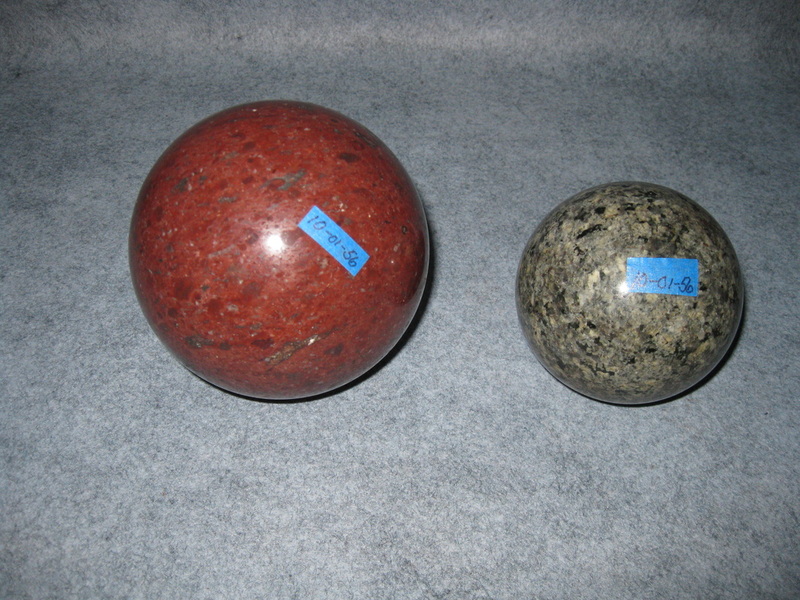 The granite ball on the right is Medium Quincy Granite. Quincy Granite came in shades of light, medium and dark. The ball on the left is Braintree pink. Braintree pink was quarried along the Quincy, Braintree line where a vein of pinkish granite was discovered. The polished balls were salesmen samples of Peter Guisippini and donated by Emily and Marie Marinelli in memory of their grandfather Peter. 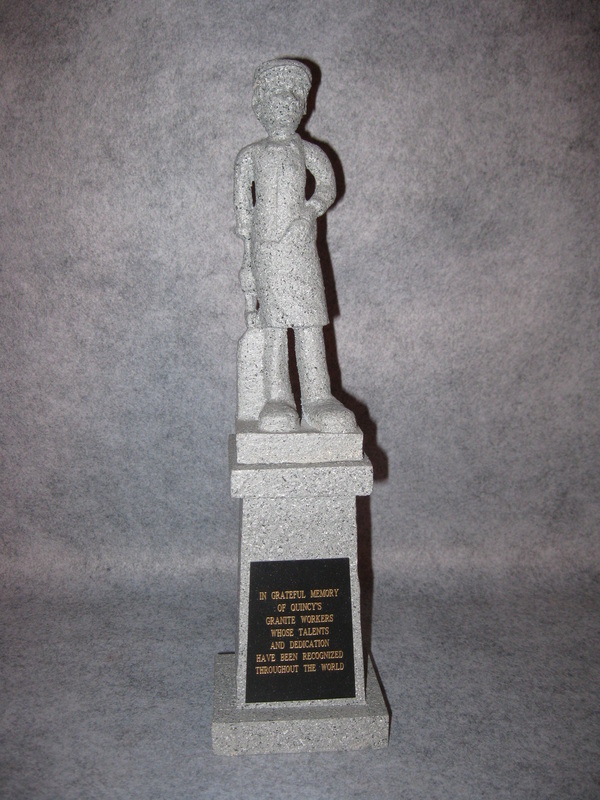 A scale model statue of a granite worker that stands in Shea Memorial Park, West Quincy. The statue is dedicated to all granite workers who worked in the industry giving Quincy the title"The Granite City". This sculpture stands 16" high and is made of basswood and coated with a special type of paint to give the texture of granite. Sculptured and donated by Leo DePolo of Quincy. 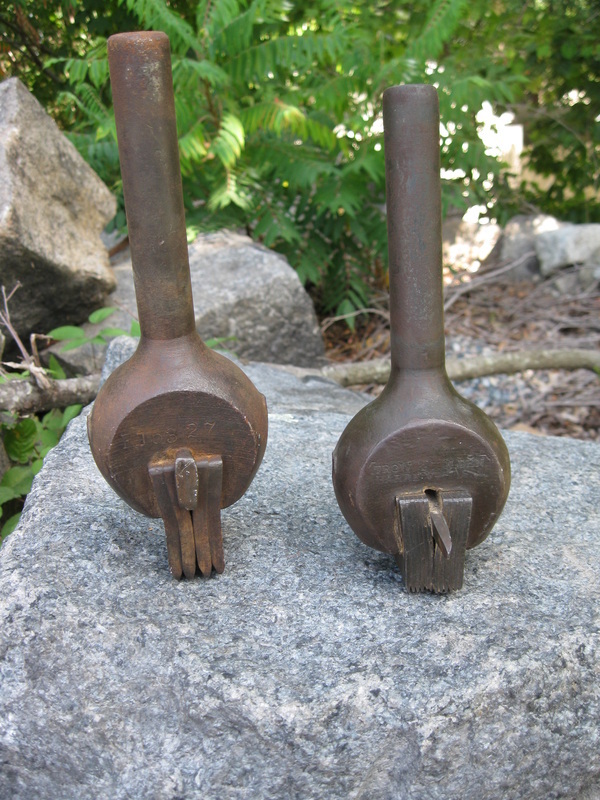 The pneumatic hammer was designed and patterned in 1885 by James Mc Coy of Brooklyn, NY. 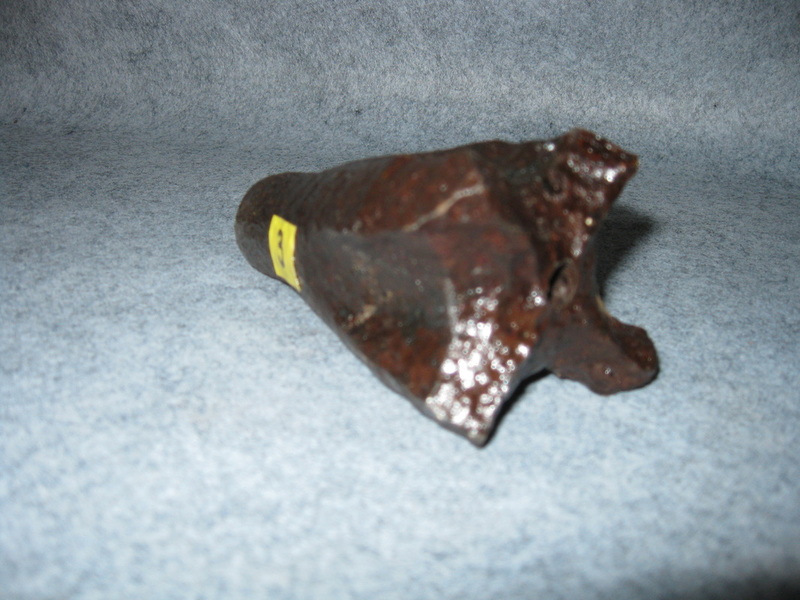 The pneumatic hammer produced a continuous sequence of impacts allowing a rapid removal of granite. This model was used by the stone cutter to do the more intricate carving on stone. The handheld pneumatic hammer and tools were donated by Tom Bonomi. line with Swingle cutting off access by Swingle to the northeast section of his quarry. The bridge was used to transport stone and equipment supporting the quarry operation. The plaque was donated by Bernie and Virginia Sweeney of Quincy in memory of his father Bernard Sweeney. Also in memory of William Yuscavitch. 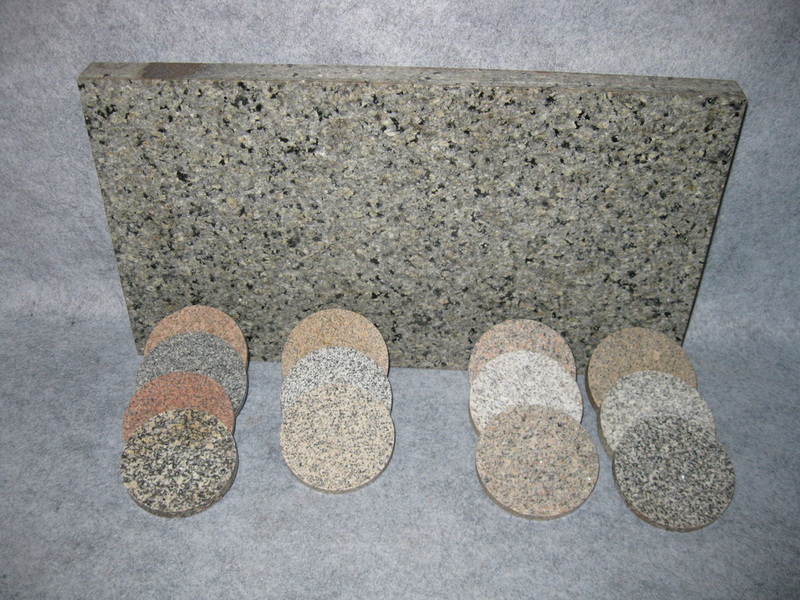 The salesman's design case was used by representatives of granite companies to show prospective buyers the company's products and design capabilities. Case included stone samples, both polished and unpolished, photos of over 100 standard designs available, representing low and medium priced stone work, estimating booklet, and miscellaneous drawing instruments for preliminary sketching of custom designs. 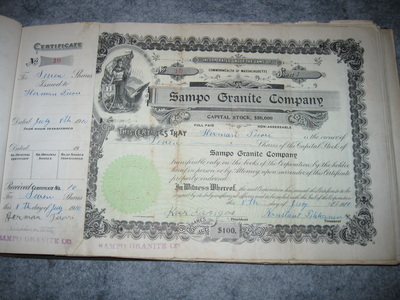 The case belonged to Andrew Nisula owner of Sampo Granite Company. 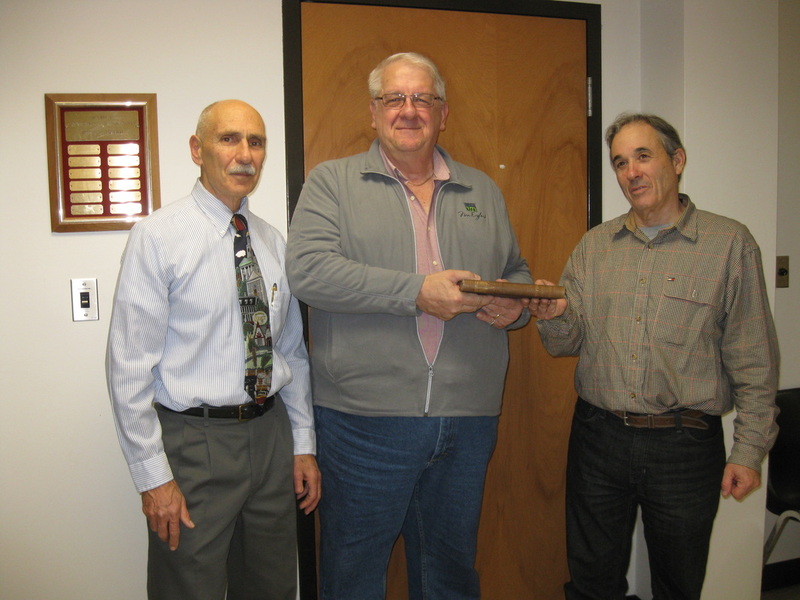 The case was donated by Paul and Paula Nisula in memory of their grandfathers, Andrew Nisula and Arthur Lindberg. Tool box and tools of Angelo Cianfarani donated by his son, Angelo. 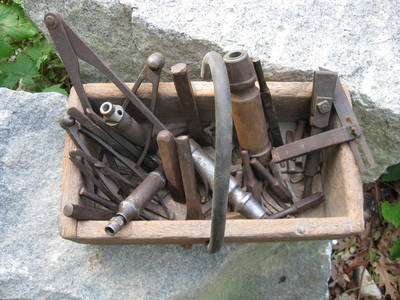 This tool box and these stonecutting tools are an example of a typical stonecutter's tool box. Each stonecutter would acquire tools that he would use in his specialty in the granite industry. Each tool box would contain a variety of chisels for specific stonecutting operations. It would also contain many types and hammer sizes. 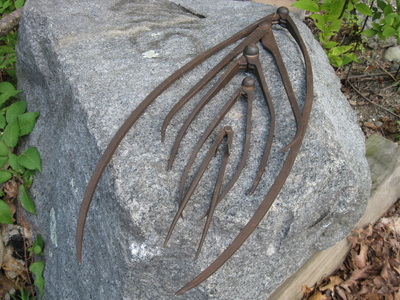 Other items related to the stonecutting operation that he would need would include a square, straight edge, level, folding rule, chalk and line, glasses, and a set of winding blocks. 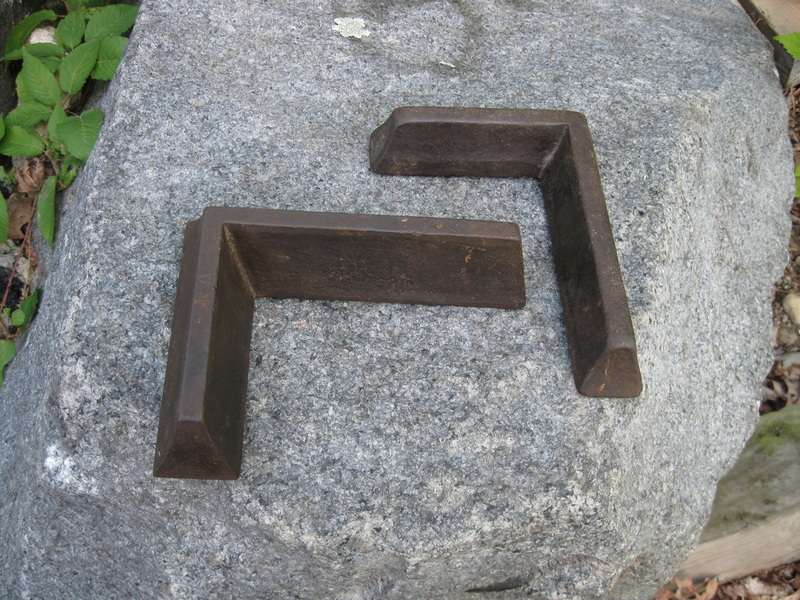 A stonecutter would often work for many different granite manufacturers. When work slowed down in one shed he would be employed by another who had work. The tool box allowed the transport of his tools to his place of employment. 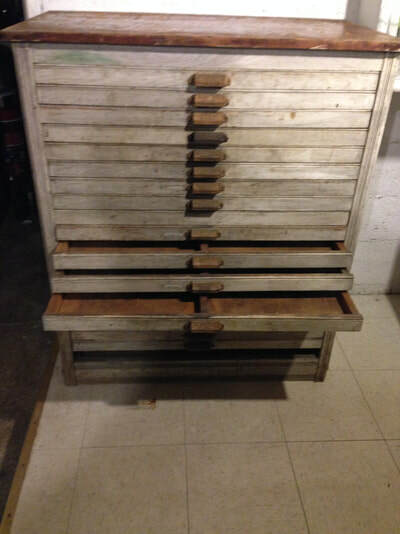 The acquisition of this wooden tool box in it's excellent condition is a museum quality artifact to display.